You know that feeling when you buy something and once you have it, you wonder how you survived all your life without it? That’s how I feel about Cynthia Rowley’s flounce dress. I got it just the other day and am obsessed with it. The silhouette is easy and comfortable and it really can be worn with anything. This flowy frock is great for daytime as shown here, but I can’t wait to dress it up for a night out! Such a versatile piece that is completely season-less. Guess what? It also comes in three other colors. I’ll definitely be picking up another one, most likely in red. So good, right? I bet you’re also curious about what’s dangling from my wrist. Yes it’s a cuff, and yes it’s also a flask, and yes it’s incredible. Such a fun accessory that I can see being really useful at music festivals, day parties, and the like. Hilarious and brilliant. Click here to buy! As you can see, I’m a HUGE fan of Cynthia Rowley – so much so, that I’m partnering up with the designer herself for a fabulous event at Stanley Korshak in Dallas next week! Come see us at the famous luxury department store on Thursday, April 17th from 4:30-6:30pm. You’ll have a chance to chat with the designer (and me!) and shop her latest collection. Trust me, it’s not something you want to miss. Hope to see all of my DFW-area readers there! PS – say hello to my new Chanel boy bag that I debuted on Instagram a couple weeks back. Isn’t he handsome? Also a newbie to my wardrobe are the Chanel chain-adorned sandals that I also gushed about on Instagram about a month ago. I’m definitely stocked up for spring! That little dress is so cute, love your sandals and the new bag is everything! This is simplicity at its finest – so chic! Love the easy shape of this dress and that you paired it with flat sandals…perfect look!! Love, love this black and white ensemble. That dress is so flirty and fun! I’m in love with the style of this dress! So simple and perfect. I love how you accessorized it too. LOVE this dress on you, it’s the perfect silhouette! So easy! Oh my got that dress is amazing. You are such a style maven! So gorgeous on you! 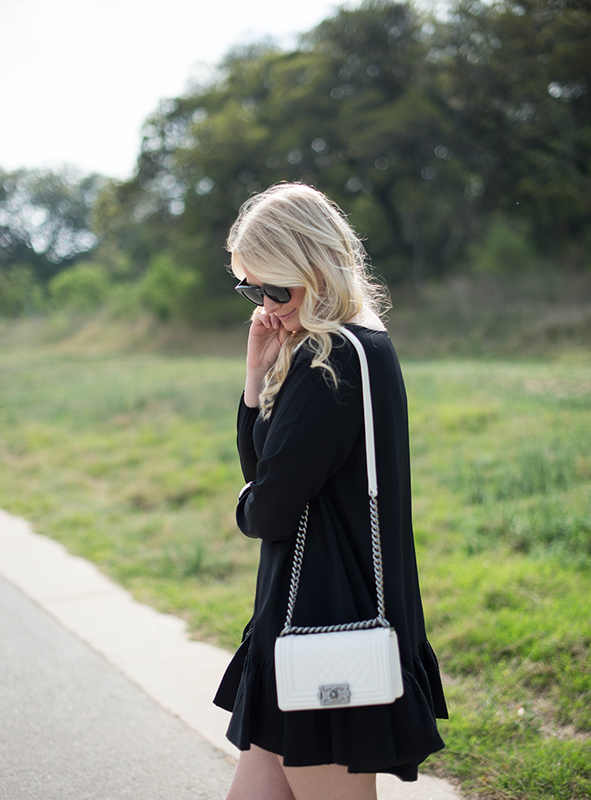 Love this twist on the LBD. I LOVE this dress Merritt! Such an easy style – and with soft curls perfect for spring/summer! Merritt, I’m loving this! The dress looks so comfy yet so cute and that Chanel boy bag… swoon!! This look is so perfect! I LOVE when you purchase the perfect item and you know it was well worth it! That Chanel bag….I am dying. Gorgeous. Ahh that dress is so girly and fun! And I see you are wearing the flask bracelet! Love it! I LOVE easy dresses like those! So fun and those earrings are fab too. Great look! I love all of the accessories! That flask bracelet is too cool! this dress has been in my shopping cart love!!! This dress is GORGEOUS! Love how you paired it with the sandals! Too cute! I love the ruffles! This dress looks so comfy and cute! The dress looks fantastic – I love it! You have definitely inspired me to stop into Cynthia Rowley asap. Pretty obsessed with that cuff flask – You look stunning in these photos too! If I lived in the area I would love to come! Loving this dress and your hair is so pretty! Yay! We can’t wait to have you here soon! That LBD is my new favorite and I don’t even own it yet! So cute! Stop it! I have been going nuts over that dress!!!! It looks amazing on you. Love how you styled it. Oh, and that bag in white is unbelievable. I coming to Dallas and raiding you closet! I’m obsessed with that dress it looks so light and playful for the spring and summer seasons! I definitely know that feeling. This dress is awesome, I love a good ruffle. The event sounds really fun, I will try to make it! LOVE that dress on you, so cute! I wish I lived closer to attend your event! It would be so much fun! Hope you have a blast! XO and I love the outfit! Merritt, your accessories closet is BEYOND! And, I’m beyond bummed that I live 3 hours away from Dallas. Hope the event is a huge success! What a fabulous, go to dress! I love it! I love the silhouette of this dress and that you paired it with those chic sandals! This is the perfect ensemble…comfortable and cute. Love it. Love me some flouncy! And those earrings are gorgeous! What a beautiful outfit. I love all the black with a touch of white. I am going to have to go check out that Cynthia Rowley dress, I love how it can be a classic black dress but it has some added flair! 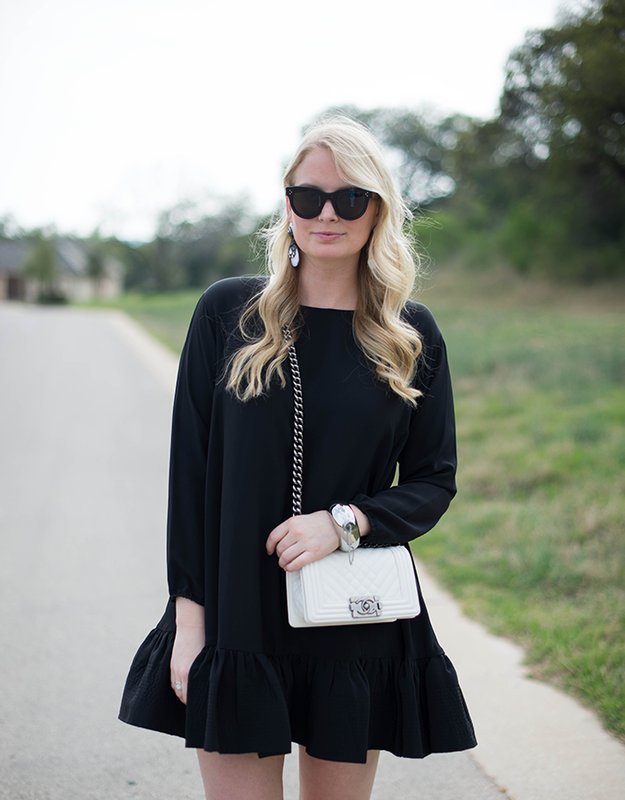 I fell in love with this LBD since I saw it on your instagram account! Nice style!